Two of Canada’s most accomplished curlers will be inducted into the Canadian Curling Hall of Fame, it was announced today. Cathy Overton-Clapham, left, and Christine Jurgenson are being inducted into the Canadian Curling Hall of Fame, it was announced today. 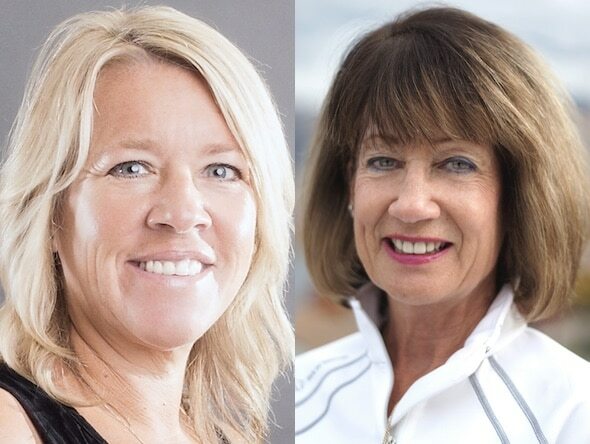 Cathy Overton-Clapham of Winnipeg and Christine Jurgenson of Osoyoos, B.C., will be formally inducted during ceremonies at Curling Canada championships later this curling season. 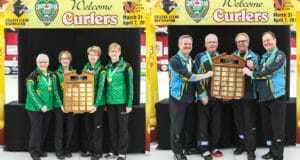 Overton-Clapham will be inducted during the Tim Hortons Brier, March 3-11 in Regina, while Jurgenson will be inducted during the Scotties Tournament of Hearts, Jan. 27-Feb. 4 in Penticton, B.C. Overton-Clapham, who’s still active — she’ll be playing third with Chelsea Carey’s team at the 2017 Tim Hortons Roar of the Rings, beginning Dec. 2 in Ottawa — has been winning championships since she was a teenager. She won her first provincial junior championship in 1986, and then skipped Manitoba to victory at the 1989 Canadian Junior Championships, and followed up with a bronze medal a year later at the 1990 World Junior Championships in Portage la Prairie, Man. She followed that with a brilliant career in women’s curling, winning five Scotties Tournament of Hearts titles; only fellow Hall-of-Famer Colleen Jones with six has more. Overton-Clapham won her first women’s provincial championship in 1991 at the age of 21, followed by winning her first Canadian championship in 1995 playing third with Connie Laliberte. 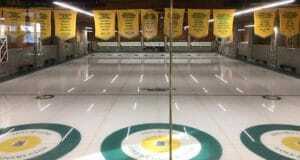 She would then go on to win four more playing third with Jennifer Jones — in 2005, 2008, 2009 and 2010. 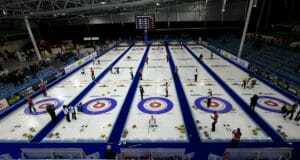 Overton-Clapham has played in 12 Scotties Tournament of Hearts. She also won a world championship gold medal in 2008 at Vernon, B.C., with Jones, to go along with a bronze she won with Jones in 2010 at Swift Current, Sask., and a silver she won with Laliberte in 1995 at Brandon, Man. Jurgenson, meanwhile, is a four-time world championship gold-medallist representing Canada. Her first came in 1986, not long after she won the Scotties Tournament of Hearts in London, Ont., playing second with her sister (and fellow member of the Canadian Curling Hall of Fame) Marilyn Bodogh. At the 1986 World Championship in Kelowna, B.C., Jurgenson won gold after Team Canada beat Germany’s Andrea Schöpp in the final. Jurgenson would play in six editions of the Canadian Women’s Championships, representing three provinces (Ontario in 1980 and 1986; Alberta in 1983; B.C. in 1995 and 1997) in addition to one Scotties as Team Canada in 1987. In 2008 at Prince Albert, Sask., she threw lead rocks with Pat Sanders’ gold-medal B.C. team that won gold at the world seniors a year later in Dunedin, New Zealand. In 2010, it was Jurgenson skipping the B.C. team that won the Canadian championship in Ottawa, and followed up with a gold medal at the 2011 World Seniors in Saint Paul, Minn. In 2013, Jurgenson joined Team Canada as the alternate with the Cathy King-skipped team that posted a perfect 8-0 record en route to winning the gold medal at Fredericton, N.B. There’s still another week to nominate candidates to be inducted into the Canadian Curling Hall of Fame for the 2017-18 season. CLICK HERE for more information; the nomination deadline is Nov. 30.